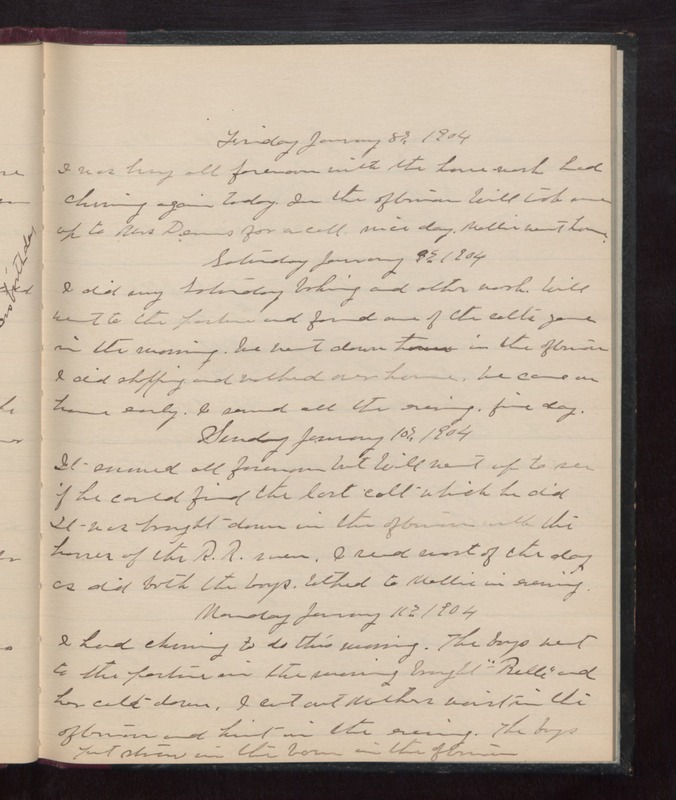 Friday January 8th 1904 I was busy all forenoon with the house work, had churning again today. In the afternoon Will took me up to Mrs Dennis for a call. nice day. Mollie went home. Saturday January 9th 1904 I did my Saturday baking and other work. Will went to the pasture and found one of the colts gone in the morning. We went down town in the afternoon. I did shopping and walked over home. We came on home early. I sewed all the evening. fine day. Sunday January 10th 1904 It snowed all forenoon but Will went up to see if he could find the lost cold which he did. It was brought down in the afternoon with the horses of the R.R. men. I read most of the day as dud both the boys. talked to Mollie in evening. Monday January 11th 1904 I had churning to do this morning. The boys went to the pasture in the morning brought "Belle" and her colt down. I cut out Mothers waist in the afternoon and knit in the evening. The boys put straw in the barn in the afternoon.